History, Collection Highlights, Exhibitions, Opening Hours. of Celtic art from the pagan Iron Age. Found in Broighter, County Derry. Founded in 1890, the National Museum of Ireland (Ard-Mhúsaem na hÉireann) is a major cultural institution consisting of four centres: three in the capital Dublin and one in County Mayo. The National Museum of Ireland has a strong focus on Irish art, the history of Irish art and Celtic culture. The History and Archaeology part of the museum (Kildare Street, Dublin) commemorates prehistoric Ireland, with an emphasis on Irish metalwork. It highlights early Celtic gold masterpieces, illuminated religious manuscripts, outstanding examples of later Celtic metalwork and numerous church treasures from the medieval era, including the Viking age, and later times. The Museum houses special displays of artifacts from Egypt, and the Roman world, augmented at regular intervals by special exhibitions of Ancient art. The Tara Brooch (c.700 CE). 1850 near Laytown, County Meath. Among the many outstanding early Irish exhibits are such masterpieces as the Ardagh Chalice, the Derrynaflan Chalice, the Derrynaflan Paten, the Moylough Belt Shrine, the Petrie Crown, the Tully Lough Cross, the Cross of Cong and the Tara Brooch, as well as the Broighter Hoard (including the gold Broighter collar and the gold Broighter boat, complete with anchor, mast, rowing benches, oars, and boathook.) Several of these Celtic Irish treasures would have been lost or melted down but for the intervention of archeological experts (eg. George Petrie) from the Royal Irish Academy and the Royal Society of Antiquaries of Ireland. These items in the National Museum of Ireland help to trace the development of Irish visual arts from the Newgrange era to the medieval Irish renaissance following the eclipse of Rome and the Dark Ages. The National Museum of Ireland collection contains some of the most important Irish antiquities of Celtic culture, discovered in Munster, Connacht, Leinster and Ulster, including personal gold jewellery, Viking swords, reliquaries, episcopal sculpture and croziers, as well as ecclesiastical metal vessels. Many items display exquisite craftsmanship, encompassing traditional metallurgical skills of casting, soldering, riveting, and mechanical joint-making; plus advanced goldsmith art involving the use of gold plate, gold foil, and delicate filigree work. Other specialist arts and crafts featured in these items include millefiori glass ornamentation, carving in ivory, amber, and engraving. Much of the abstract designwork is executed using Celtic patterns such as zoomorphic (animal-form) or geometrical motifs. Here are some of the highlights of the museum's collection of precious metal antiquities. Located in the Knowth megalithic passage tomb. Made of grey flint, it contains outstanding decoration in low-relief, with spiral designs. See also Visual Arts in Meath. Made of sheet gold, they comprise one of the earliest collections of gold objects found in Ireland. See also Visual Arts in Cavan. Exemplifies the craft of the Irish goldsmith in the Bronze Age. Decorated with simple pattern of hatched triangles. See also Visual Arts in Monaghan. Retaining a perfect crescent shape, this exceptional gold ornament is decorated with lozenges, hatched triangles and zig-zag motifs. See also Visual Arts in Tyrone. The armlets are made from heavy sheet gold, while the necklet is fashioned from gold wire, almost 15 metres in length, wrapped over a leather thong. See also Visual Arts in Co Offaly. Fashioned from fine sheet gold, decorated with concentric circle patterns and traditional motifs on raised bosses. See also Visual Arts in Co Westmeath. 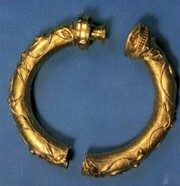 Although undecorated, the bracelet and fasteners are made from solid gold. See also Visual Arts in Co Wexford. Consists of four split-ring ornaments with discs. The disc is made from fine gold foil with complex decoration. Decorated in diverse patterns of concentric circles, geometric motifs and gold filigree. See also Visual Arts in Co Kildare. Ceremonial jewellery, made from gold foil and gold wire. See also Visual Arts in Co Clare. Exhibits repousse style decoration of spirals and S-shapes, with gold wire. See also Visual Arts in Co Roscommon. Metal trumpet with first-class riveting craftsmanship, decorated with spiral bosses; comparable with the Cork Horn and Petrie Crown. See also Visual Arts in Co Armagh. This comprises four gold ribbon collars fashioned from twisted gold, together with a number of bracelets made from thin bronze rods decorated with incised linear patterns, and amber bead remnants of a necklace. Part of a large number of gold, silver and bronze ornaments and implements found near the famous Passage Tomb of Newgrange, these rings have three coils decorated with transverse notches on the upper and lower edges. Full-length late medieval relief-sculpture carved from a limestone pillar, featuring a bearded cleric in full bishop's attire with mitre and crozier. See also Visual Arts in Co Louth. Comprises four hinged metal-plates enclosing fragments of a leather belt. The two at the front make up a false buckle. The frames of these plates are ornamented with heads of animals and birds and glass edgings. See also Visual Arts in Co Sligo. 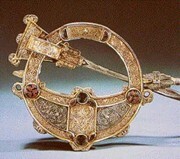 Uniquely, this is the only Irish brooch yet discovered, made entirely of gold. Features exquisite gold filigree work with numerous zoomorphic designs. See also Visual Arts in Co Derry. Fashioned from gilt silver and decorated with gold filigree, it was nicknamed the 'Queen's Brooch' after a replica of it was presented to Queen Victoria upon her visit to the Great Exhibition in Dublin (1853). Made from silver but decorated with gold filigree and big amber studs. See also Visual Arts in Co Tipperary. Made from silver in a Pictish style, its now-empty panels are thought to have originally contained gold filigree and glass ornamentation. Discovered: Kilmainham, County Dublin, but traceable to a collection of objets d'art, from eighteenth century Sligo. See also Visual Arts in Co Limerick. Made from cast and gilt copper-alloy, the plaque is believed to have been attached to a cross or reliquary. The background to the figure is ornamented with ribbon interlace and spiral motifs. See also Visual Arts in Co Laois. Fashioned out of hammered silver, this item of Viking jewellery displays a tight composition of animal motifs. On the rear of the brooch appear four Irish names written in Ogham script: possibly former owners of the brooch. See also Visual Arts in Co Kilkenny. The most outstanding example of a Viking sword in Ireland. Probably made in Norway by Ulfbehrt, whose name is etched into the iron blade. Includes a huge ring fashioned from three twisted gold rods. It weighs about 380g making it the largest gold ornament found in Ireland. See also Visual Arts in Co Carlow. Fashioned from cast silver, decorated with zoomorphic patterns (similar to those on the Killamery Brooch) and embellished with gold filigree work, silver and amber. Made from cast silver, this also features animal designs reminiscent of the Killamery Brooch. See also Visual Arts in Co Antrim. One of the most outstanding examples of Irish metalwork of the early Christian era, it was made for use in processions and enshrined a relic of the True Cross which had come into the possession of Turlough O'Connor, High King of Ireland in the early twelfth century.Rich in zoomorphic decoration, it also features gold filigree, niello plus blue and white glass bosswork. Designed to enshrine the gospels of St Molaise of Fermanagh, it is considered to be the oldest surviving Irish book shrine. Its front features panelling of gold filigree and gilt silver, interspersed with symbols of the four Evangelists. See also Visual Arts in Co Fermanagh. Made from wood enclosed by metal plates, it was later embellished with rock crystal, ivory and glass beads. This hollow crook, made for the Bishop of Lismore, was cast in a single piece. It features panels decorated with animal motifs, as well as white millefiori glass in chequerboard patterns. At the sides, the ornamentation consists of blue glass beading, inset with additional red and white millefiori. See also Visual Arts in Co Waterford. Designed as a neck-fastener for gowns in the 13th and 14th centuries. Made to enshrine a manuscript or gospel text personally written by St Columba, it was carried into battle by the O'Donnells as a talisman of victory. Unfortunately it was captured in 1497. See also Visual Arts in Co Donegal. Designed to enclose a text given by St Patrick to St. Macartan. Its decorative features, added in the fourteenth century by John O'Carbry Abbot of Clones, include figures of saints grouped around the crucifixion, plus Old Testament scenes of St John the Baptist, and Salome the daughter of Herod. A beautiful piece of metalwork featuring the Virgin Mary, St John together with Irish saints all grouped around Christ on the Cross. See also Visual Arts in Co Galway. The Natural History Museum, which is also part of the National Museum of Ireland, is located on Merrion Street in central Dublin and houses exhibits and specimens from the animal kingdom around the world. Neither its collection of exhibits, nor its Victorian style building have altered greatly since the early twentieth century. Opened in 1997, the historical decorative arts section of the National Museum of Ireland is situated at the Collins Barracks site, a former military building named after Michael Collins. This site houses the NMI's administrative centre, as well as the Great Seal of the Irish Free State. Among the many exhibits are items of furniture, silver, ceramics and glassware, money and weapons, as well as examples of folklife and costumes. A medieval Chinese porcelain vase dating from about 1300 is one of the highlights. In addition, the decorative arts section holds regular special exhibitions throughout the year. The Museum of Country Life, in Castlebar, in County Mayo, is the newest section of the National Museum of Ireland. Opened to the public in 2001, this section commemorates day-to-day Irish life from the mid-1800s to the mid-1900s, notably rural Ireland in the 1930s. There are special exhibits on the home, the natural environment, and forces for change. Turlough Park, Castlebar, Co Mayo.  For details of other fine art exhibitions and collections, see: Irish Art Galleries and Museums.  For details of the world's top museums, see: Homepage.